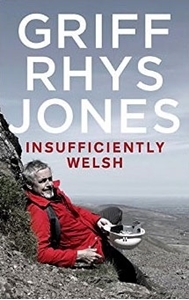 In this informal guide to Wales, Griff Rhys Jones rediscovers "the land of his aunties". Born in Cardiff but raised in Essex, Griff is returning home on a mission to explore the real Wales: the one beyond the tourist trail that exists in the deep beautiful countryside, full of hidden treasures and eccentric characters that makes this country so unique. With help from a hidden hand, Griff is set a number of quests in eight distinct regions that not only test his knowledge of his homeland but his body too, as he climbs, abseils, rides and canoes his way through some truly breathtaking scenery. Join Griff on his journey through Snowdonia, Anglesey, the Gower, mid Wales, Brecon, Pembrokeshire, north Wales and Monmouthshire. Packed with all manners of weird, wonderful and enlightening facts, you'll learn as much about Wales as you do Griff. Is Griff insufficiently Welsh? Published to coincide with Griff 's Guide to Wales series aired on ITV1 in January 2014 . Full colour hardback edition featuring photography from the series.